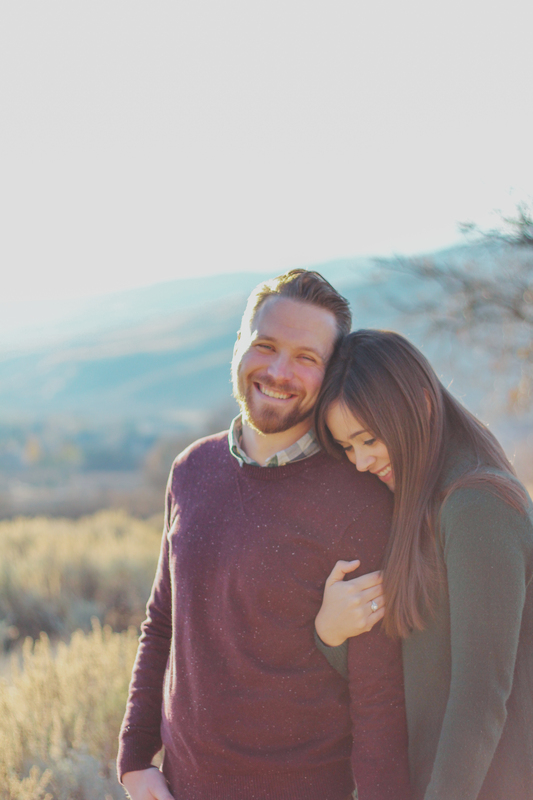 For the first few months when I was engaged, I felt that I should buy a bridal magazine every time I went to the store. As time went by, the pile became increasingly larger, but I started regretting buying so many magazines because they all had the same ads and information. But one magazine I 100% do not regret buying is Martha Stewart’s Bridal magazine. Let me tell you, Martha knows how to throw a wedding. 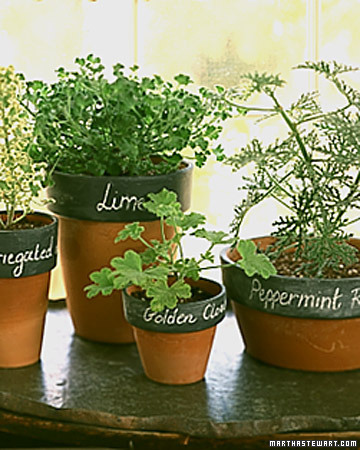 Now that we have been cooking a lot, I thought it would be fun to grow our own herbs, especially cilantro. It’s both useful and decorative! 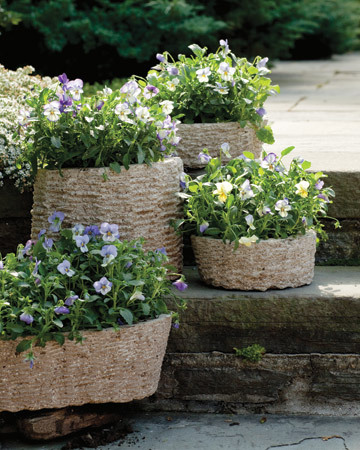 We have a really nice front porch and side patio, but it’s quite bare, so I really want to get some flowers, and these homemade wicker baskets are such a cute touch! 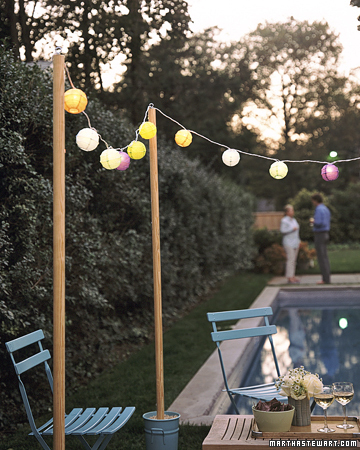 We have a strand of these from our wedding reception and didn’t know what to with them, next time we have a little dinner party, I am going to hang them out on our patio! We were given three cake platters for wedding gifts. I know I should have taken one, or even two back, but they were each so different and extremely presh, I just couldn’t give any of them up. But I decided if I was going to keep them, I had to use them. 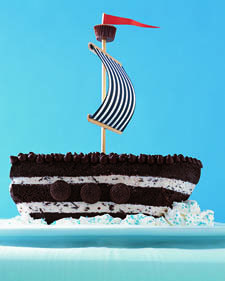 So first thing on the list: this chocolate chip ship-icecream cake! To beat Martha’s creativity, which is what it’s all about, I’m going to add those lego pirate men! I think this is another great idea. I really like wallpaper. 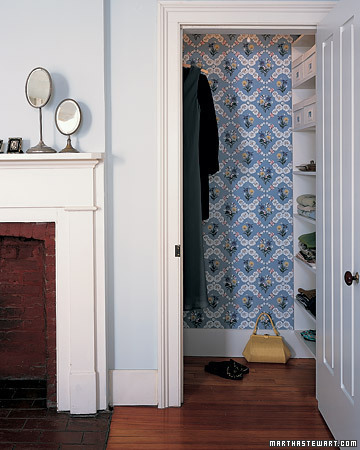 But clearly it can be overwhelming and too much chaos to wallpaper a whole room. So to put it in a closet is perfect because it brightens up the space and accents the rest of the room. That’s all for now. Thanks Martha!